Individually wrapped cupcakes were delivered on July 26, 2017, to the law enforcement officers of the Denham Springs and Walker Police Departments as well as the Denham Springs City Marshals. They were given in acknowledgment of the selfless service these officers give to our communities. Officers Laura Jenkins and Bailey Newsom with Pilots Gail Langridge, Dianna Schenk and Stella Corley. Pilots Terri Borde, Sarah Sullivan and Sandy LeBlanc prepare Pick Me Ups. Denham Springs Marshal's Office Pilots Stella Corley, Dianna Schenk and Gail Langridge with officers Darryl Averitt and David Hooter. Today, more than ever, America faces trying times. There’s uncertainty in our national security, and for the future of our people and our nation. Threats and acts of terrorism and war at home and abroad, economic dependence and instability, divisive legislative policies, crumbling family units, tests of our faith, and challenges to our beliefs, our rights, our educational systems and our spiritual institutions weigh heavily upon us all. America is becoming a nation divided. If we do not stand united, together we will fall. We must “cry out for America” together. The 2015 “Cry Out America,” 9/11 Remembrance Ceremony & Prayer Service, will be held in the Livingston Parish Council Chambers, 20355 Government Blvd., Livingston, at 11:45 a.m., Friday, September 11. Citizens, businesses, government agencies, schools and churches are encouraged to take an hour off to come together as a parish on this historic day that monumentally changed our lives and our world forever. May we never forget the horrific events of September 11, 2001. Standing united against terrorism, Americans will gather at noon in courthouses all across our great nation to remember and honor the many sacrifices made on that fateful day. In one accord, prayers will be voiced for our federal, state and local governments and leaders, judicial system, educational system, military, first responders, youth and children, marriage and families, churches, media, and for the unity and future of America. Patriotic music and readings will be shared, and for one hour of our time, we can unite our voices, our hearts, our prayers and our spirits - and we can make a difference. The Chief Judge of the 21st JDC, Honorable Bob Morrison, will be this year’s Master of Ceremonies. Program participants will include ranking members of the Judiciary and Legislative branches, officials and leaders in Livingston Parish, and local clergy. Church and school leaders are asked to encourage their congregations and students to attend. Parish organizers of Cry Out America are coordinator Carolyn Hatcher, Annie Fugler, Floy Law, Janice Bourgoyne and Edith Carlin. Please invite your friends, family and neighbors. Livingston Parish, let’s raise our flags and stand up for America! Join us on September 11. For more information, contact Carolyn Hatcher at (225) 936-9066 or crhatcher1@att.net. Please contact Annie at (225) 802-6454 or anniefugler@aol.com if interested in interviews or appearances prior to event, and arrangements will be made with participants. To contribute to our shower, please contact Brandy Roberts to make arrangements at 225.304.6225 or brandy.roberts@pilotclubds.org. Have you heard of iGive.com? If you use our referral link, we'll receive donations from your purchases at no cost to you. You can also download a browser extension that both reminds you when you're on an eligible site and lists coupon codes for the site you're on. Please give it a shot! Read the note about shopping on Amazon.com before purchasing! Not quite as easy to remember as other retailers, but worth it! 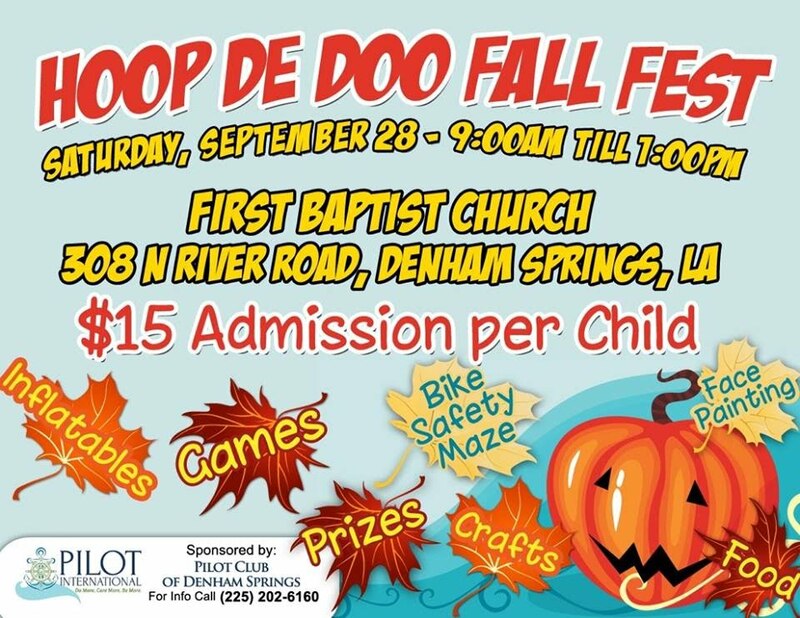 On Sept. 28th, 2013, the Club will have the Hoop-de-Doo Fall Fest at First Baptist Church from 9a-1p. It will be held indoors and out. There will be hot dogs, sweets, cotton candy, popcorn and drinks. There will be games and crafts for the children with prizes given. 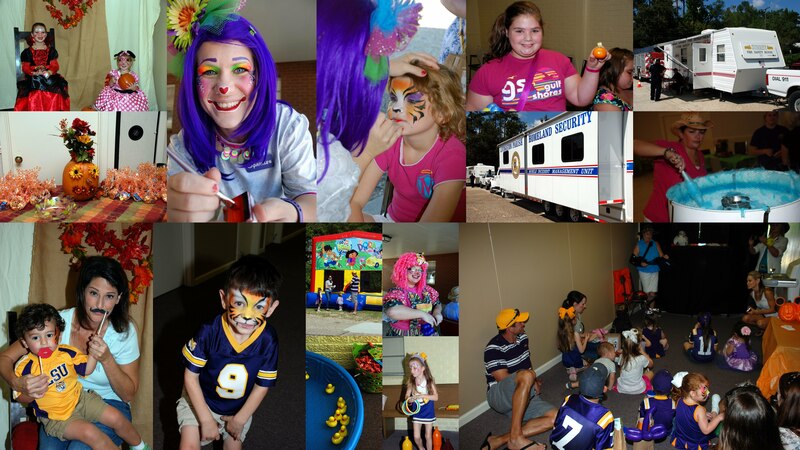 There will be a stick horse race, bean bag throw, pick up ducks in water, musical squares, a do it yourself photo booth, a clown, animal balloons, the sheriff’s helicopter will be there, a fire truck, the puppet show and McGruff. The children may come dressed in a costume, but no scary ones are allowed. The tickets are $15 and may also be purchased at the door. The Pilot Club of Denham Springs, Louisiana, received a $1,000 matching grant from the Pilot International Foundation to support area youth with significant developmental and physical disabilities who participate in the Challenger Division of Little League Baseball through the Walker Parks and Recreation. The Challenger Division enables youth with disabilities to participate in team play providing therapeutic and socialization benefits of sports in an athletic environment structured to their individualized needs. The team is open to boys and girls ages 4-18 (21 if still in school). The Pilot Club of Denham Springs will use grant funds to purchase equipment including helmets, protective gear, balls, bats, tees, bases and gloves to meet the needs of a wide range of sizes and abilities. The Pilot International Foundation is the charitable arm of Pilot International, a global organization of approximately 25,000 adult and youth members who are working together to improve the quality of life in local communities and throughout the world. Pilot’s service focus is helping people affected by brain disorders and disabilities through volunteer activities, projects, and fund-raisers.